If you believe in mermaids, today is your day to shine. Dickinsonians from all over the globe are showing their love for that quintessentially Dickinson icon—and the revolutionary worldwide community she represents—during the “Do You Believe in Mermaids?” Day of Giving. Held April 24, it is the college’s fourth-annual Day of Giving event, and the most ambitious one to date. Every gift given on April 24 helps us reach our goal of 3,500 gifts while supporting facilities enhancements, scholarships, faculty development, student-faculty research, sustainability, academic programming, student life, athletics and more. 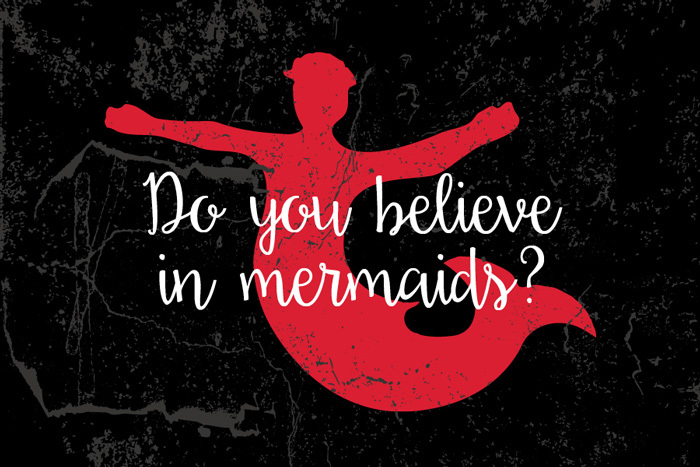 As a special thank you to loyal donors, those who make a recurring monthly gift of $5, or a recurring annual gift of $55, during this special daylong campaign will receive a “Do you believe in mermaids?” T-shirt as instant members of Dickinson’s Mermaid Society. You can make your gift go even further by taking part in one or more Day of Giving challenges. Power Lunch Challenge: 500 gifts between noon and 2 p.m. (EDT), will unlock $10,000 in funding, thanks to a challenge gift from George and Jennifer Ward Reynolds '77. Greatest Need Challenge: 2,000 unrestricted Dickinson Fund gifts will unlock $40,000, thanks to a challenge gift from George and Jennifer Ward Reynolds '77. Parents Challenge: 500 gifts from parents of current students or parents of alumni will unlock $10,000, thanks to a challenge gift from Claudia O'Brien P'18. Class of 1973 Challenge: 100 gifts from members of the class of 1973 will unlock $10,000, thanks to a challenge gift from Bucky Mansuy P'12 and Michael Mansuy '12 in memory of Jane Webster Mansuy ’73. Another way to show that good things happen when Dickinsonians come together is to help spread the Day of Giving word on social media! You can join in by liking and following Dickinson social media channels and by posting to your social media accounts with the #dsongives hashtag. Check out the Day of Giving graphics in our social media toolkit, or enhance a selfie or existing profile photo with our special Day of Giving border. Or you can take a selfie with an “I Give Because …” sign. (Please remember to make those posts visible to the public so we can find them and share with others). And if you're on campus, stop by to recharge that Dickinson spirit, make your gift in person and celebrate all things Dickinson with alumni, students, faculty and staff. 8 a.m. – 12 p.m. Give a Little, Get a Latte: Complimentary coffee from The Peddler will be available in the HUB as a reminder that great things happen when our community comes together! Enjoy fresh, sustainable coffee to power up your day. 7 p.m. – 9 p.m. Brain food in the Library: Make your gift in the Waidner-Spahr Library and enjoy healthy snacks with students, faculty and staff.